17 He came down with them and stood on a level place, with a great crowd of his disciples and a great multitude of people from all Judea, Jerusalem, and the coast of Tyre and Sidon. 18 They had come to hear him and to be healed of their diseases; and those who were troubled with unclean spirits were cured. 19 And all in the crowd were trying to touch him, for power came out from him and healed all of them. 20 Then he looked up at his disciples and said: “Blessed are you who are poor, for yours is the kingdom of God. 21 Blessed are you who are hungry now, for you will be filled. Blessed are you who weep now, for you will laugh. 22 Blessed are you when people hate you, and when they exclude you, revile you and defame you on account of the Son of Man. 23 Rejoice in that day and leap for joy, for surely your reward is great in heaven; for that is what their ancestors did to the prophets. 24 But woe to you who are rich, for you have received your consolation. 25 Woe to you who are full now, for you will be hungry. Woe to you who are laughing now, for you will mourn and weep. 26 Woe to you when all speak well of you, for that is what their ancestors did to the false prophets. When Jesus calls us “blessed” too often we receive it not a compliment but an indictment because our own experience does not match his pronouncements. The “haves” among us know that no matter how much we have it never seems to be enough. The “have-nots” among us, obviously, are dissatisfied because we too want to be among those who “have.” Together the “haves” and “have nots” embody the inequity in the distribution of resources—a conflict that seems unending. In short, none of us is satisfied with what we have. Certainly, we don’t consider ourselves “blessed.” Either way, rich or poor, hungry or filled, sick or healthy, valued or persecuted, we covet more—more respect, more possessions, more to satisfy us, more to be whole. The crowds are described as “troubled with unclean spirits” (v. 18). This is a physical description, but it also describes much more about their (and our) lives. We are troubled by other voices that too often succeed in leading us to worship the stuff of life rather than the Giver of life. Those who have this stuff prize it very much. Those of us who don’t have it, crave what we don’t have more than anything else. Either way, we remain unhappy. Things cannot satisfy us (v. 21), nor can they bring us the Kingdom of God (v. 20). Just as the people in the story were unable to cure themselves, so also we are unable to recover by ourselves. We put our trust in stuff, making idols of it, and what we get in return is the stuff of life ruling over us. Instead of being blessed, we are actually cursed. Blessings and curses (woes) are not only relational terms; they are also locational terms. To be cursed means to be in the wrong place with respect to God. Jesus uses words of “woe” to depict our bad location. Because we worship material things, and the esteem of others, we do not receive blessings but curses from God—and God’s curse is deadly. We “have received our consolation.” (You can almost hear the word “already” following that phrase, even though it’s not in the text.) In other words, there will come a time when that consolation will be used up (namely, our current wealth), and we will be left like the poor: without consolation. The final curse for all of us is not only being stuck in a struggle between being a “have” or “have-not,” but that God has a way of using us to carry out the divine retribution on each other for always having more than the other. In the meantime, the one thing we don’t have is any reward in heaven. It is noteworthy that Jesus “came down with them and stood on a level place” (v. 17). 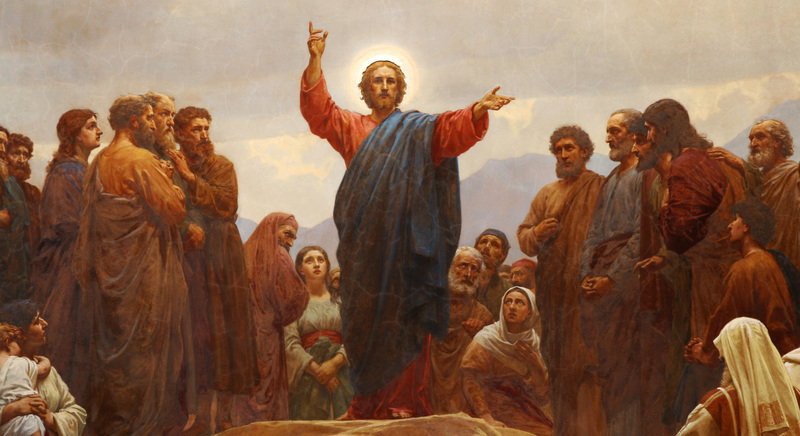 You might say that Jesus levels the playing field, eliminating the difference between the “haves” and the “have-nots.” That could sound like more woes, were it not for the fact that such leveling is Jesus’ way of reconciling. Jesus takes on the curse of being “leveled” with us as one hated, excluded, reviled (22:63-71). Humanity put a curse on Jesus the Christ at Golgotha, and he willingly suffered that curse rather than assert his “right place” with God. But that is how our relationship has been changed from “wrong” to “right” with God. “On account of the Son of Man” (v. 22), we are blessed, indeed! To hear and grasp Jesus’ pronouncement, “blessed are you,” is to be “blessed.” Another word for being “blessed” is being “happy.” Blessing is something that is not only given, but can only be appreciated when it is received—or it is has no effect. We are happy and satisfied with Jesus’ claim because we “take his word for it.” Such believing/trusting brings us a reward in heaven here and now. Happiness is, therefore, not based on happenstance, but on account of the Son of Man. We are no longer ruled by the passions and dictates of “stuff,” or even the favor of others, but find our center in the Son of Man, who calls us blessed. How we live this blessing is an outgrowth of how we treasure it. The happy life is not necessarily marked by happy circumstances: “Blessed are you when men hate you, and when they exclude you and revile you, and cast out your name as evil, on account of the Son of Man” (v. 22)! Others may well link us up with Jesus’ fate; but Jesus encourages us to make the most of even this blessing. When we are hated, excluded, and reviled by others, that is now the occasion for us to reach out to them and pass on the blessing that makes each opportunity a cause for joy. Being “cursed” is already a thing of the past for us. We no longer seek our satisfaction (from the Latin satis, having enough) by coveting more. By faith we already have our “reward [which] is great in heaven” (v. 23). Living the blessed, happy life we exchange conflict for Christ’s style of giving ourselves away—rejoicing all the way.